In the past, people with missing or broken-down teeth had few options for tooth replacement, and traditional types of treatment such as bridges and dentures had many disadvantages. Thanks to modern implant technology, these disadvantages have been eliminated. We can provide those in need of tooth replacement with stable new teeth that look, feel and act just like natural teeth. 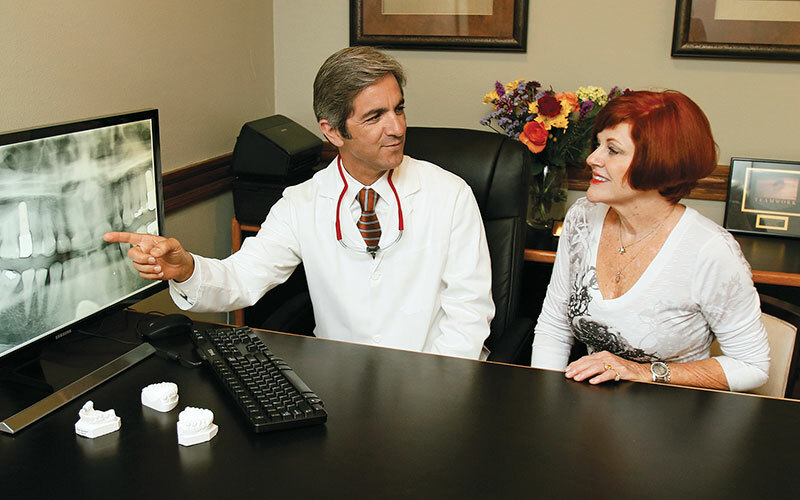 Dr. Jahangiri has over 20 years of experience placing implants. He considers implants to be an important part of modern dentistry because they are functional and long-lasting, and with proper care, they can last a lifetime. A dental implant is an artificial tooth root made of titanium. It is placed in the jawbone and a crown, dental bridge or a denture made of acrylic or ceramic is attached. 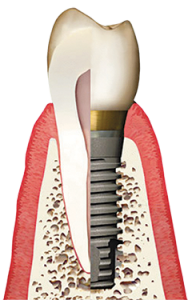 Dr. Jahangiri has the skill and experience necessary to provide all phases of implant treatment. Should any extractions or bone grafting be needed, he can comfortably take care of these without the need for outside specialists. 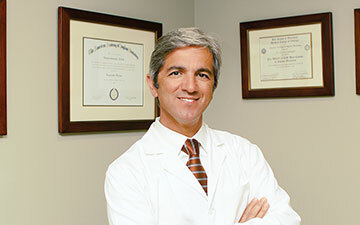 Dr. Jahangiri is highly trained in all aspects of implant dentistry and has experience with a wide variety of cases. 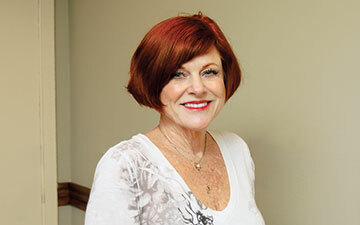 He has been placing implants since 1996 and has provided dental implant treatment to thousands of patients. In recognition of his knowledge and skill in implant treatment, Dr. Jahangiri was awarded an associate fellowship with the American Academy of Implant Dentistry, a prestigious status that is earned through a rigorous examination of theory and practical competence. Get a free consultation with Dr. Jahangiri. Call (949) 646-7707 to schedule your appointment. 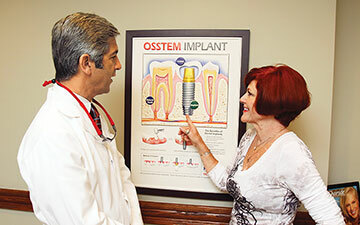 Dr. Jahangiri provides high-tech, precision implant treatment. Our state-of-the-art 3D CT scanner enables Dr. Jahangiri to view your oral structures in accurate detail. He meticulously plans out where your implants will be placed using special 3D software, which makes the actual placement straightforward and more efficient. To ensure your maximum comfort during treatment, Dr. Jahangiri provides IV conscious sedation that puts you in a light, sleep-like state. Dr. Jahangiri also uses special growth proteins extracted from your own blood to speed up healing and help reduce any discomfort following your treatment. 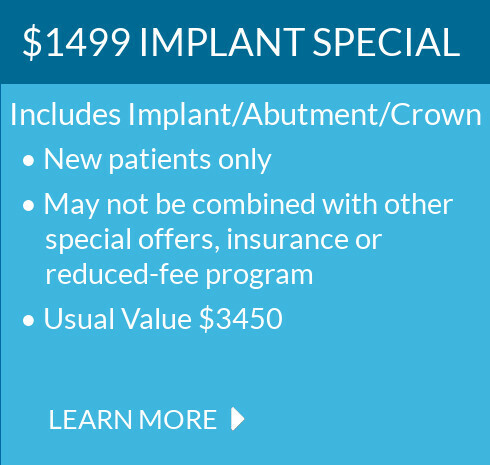 To replace a single missing tooth, Dr. Jahangiri recommends a dental implant topped with an aesthetic porcelain crown. 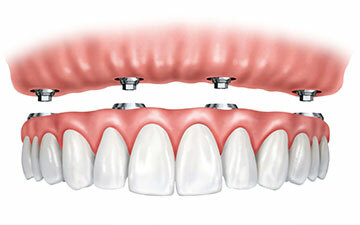 If you have several adjacent missing teeth, he uses either individual implants or an implant-supported bridge. If you need to replace a full arch of teeth, Dr. Jahangiri can provide you with a snap-in denture that is held in place by dental implants. This gives you more stability and chewing power than traditional dentures and is the most economical full-arch tooth replacement method using implants. For the greatest stability and most lifelike function, Dr. Jahangiri recommends fixed-in new teeth supported by more dental implants. This option provides you nearly the same power as that of natural teeth and can dramatically improve your quality of life. Dr. Jahangiri can provide you with any needed extractions, implant placement and beautiful temporary teeth in a single day in one office. Implants look, act and feel like natural teeth. People usually do not notice any difference between their implants and their natural teeth. Implants are the strongest and longest-lasting option for tooth replacement. Implants don’t require alteration to the structure of adjacent teeth, as dental bridges do. 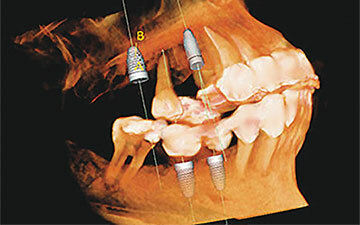 Implants help preserve the bone in the jaw. They prevent the collapsed, wrinkled look caused by the bone loss that occurs as a result of missing teeth and dentures.